I simply remember my favorite things and then… I bet you thought I was going to say, and then I don’t feel so bad, but no. I was going to say, then I feel wonderful! I guess it all depends just how much we love those favorite things we’re remembering. 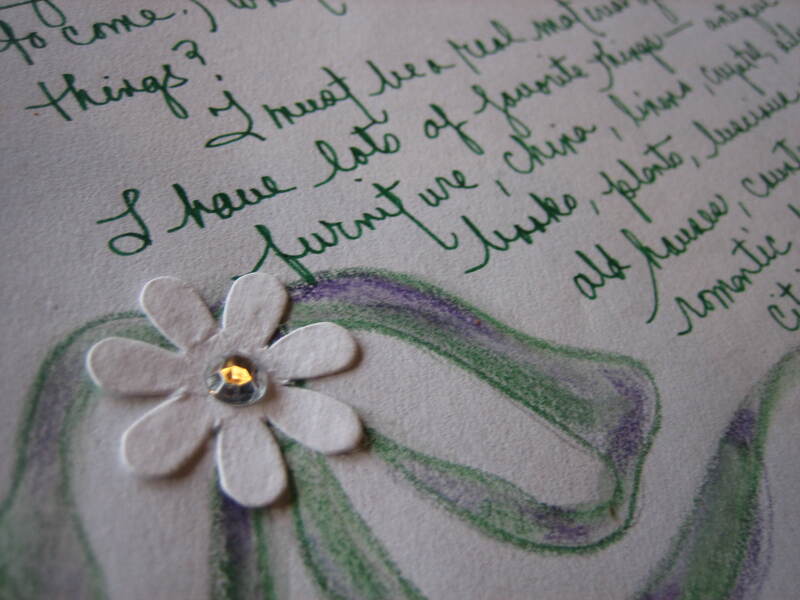 Well, I have a lot of favorite things and I hope you do too, but as you might imagine, a lot of my very favorite things have to do with The Art of Letter Writing. Do you realize how hard it is, if not impossible, to focus on two things at the same time? There could be dirt all over the floor along with other things not so pretty, but in that same room there could also be beautiful objects- flowers, gorgeous paintings, pretty fabrics… If we focus our attention on the lovely things, we will feel one way – probably lovely, but if we focus our attention on the dirt and mess, we just might feel quite differently. My point here is simple. We should train ourselves to focus on those things which make us feel wonderful, unless of course we’re in the process of working on those other more dreary items in order to improve or eliminate them. Of course, that’s if we want to be happy, but I rather like to be happy myself, don’t you? Not all my favorite things are of a material nature, but we do live in a material world after all, so many are. I love and live in an old house. I love antique china, linen, crystal, and I love using these things daily. I love country inns and elegant old hotels and try to visit them often. I love cities oozing with charm and I love nature in all its glory. There’s also puppy dogs and girl friends, afternoon tea and intimate candlelit dinners. 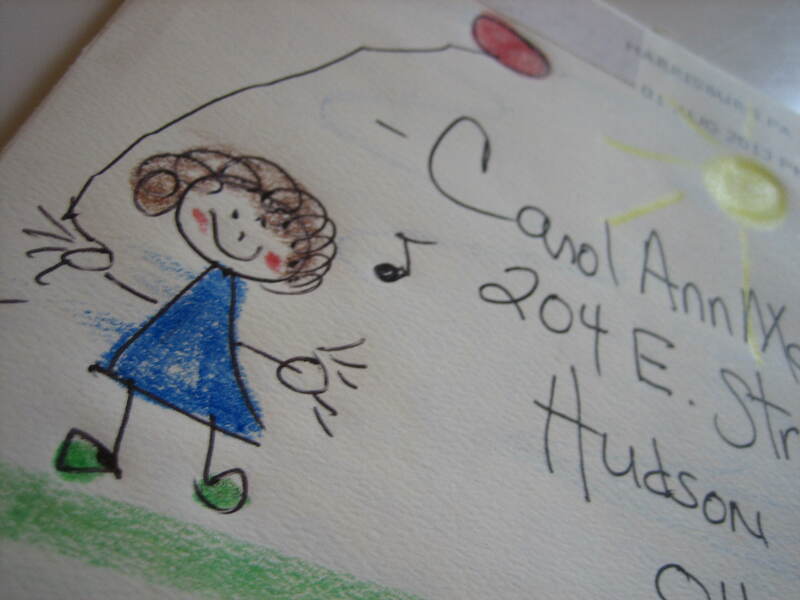 music, art, books, cooking and baking… the list goes on and on. Yes, I must be a real material girl for I love all sorts of material things, and just as Oscar Hammerstein II suggested, simply remembering these favorite things can prevent dreary thoughts from taking hold. Cultivating rituals around these things is even better, for then these favorite things develop into passions and living with passion is wonderful. Do you live with passion? 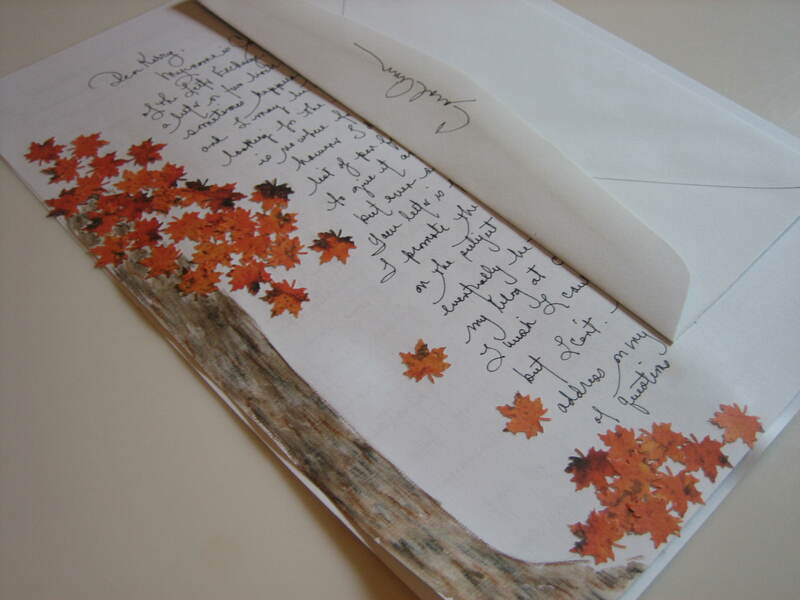 Because The Art of Letter Writing has become a passion with me I am also quite passionate about the physical materials used in creating my letters. As some might feel a thrill of excitement when discovering a shoe or sporting goods shop I feel that excitement at a stationery store. 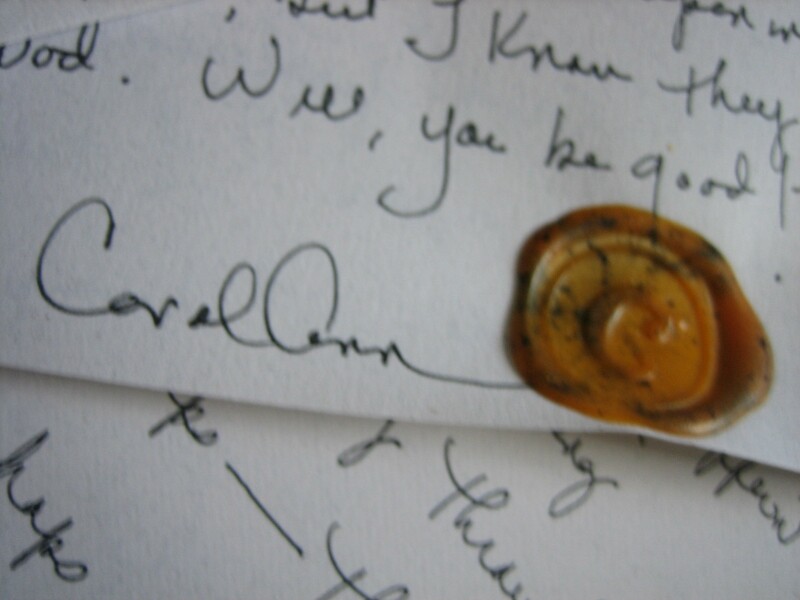 Sealing wax in all its colors of the rainbow enchants me. I love particular pens and inks, paper in all sizes and colors. I love stickers and ribbon, water color pencils and paper punches that stamp out tiny little leaves for autumn tree designs for my stationery. What we have to say in a letter is important of course, perhaps the most important thing, but the look of our letter adds an element of fun and put the two together and we have ART! I know not everyone gets as carried away with the “art” aspect of letters as I do. I had a correspondent, a Scottish lady in Canada, who cleaned offices after hours. Her stationery consisted of the half-used paper she’d find in the wastebaskets there. This paper worked for her and maybe that would work for you too, but for me and a lot of my penfriends the art aspect of letters is at least 50% of the fun. I would never tell anyone how their letter must look or what materials they should use in writing it because this reminds me of a certain interior designer I know who preaches individualism and yet has a list of do’s and don’ts for her customers that totally erases all their individuality. “Don’t cover your windows”, she says. “Let the light pour in.” “Don’t choose dark colors. They’re depressing and dreary.” Ha! Says who? Says this decorator. But maybe her customers like dark colors and drapery. Maybe you like typing black words onto white paper for your letters and if that makes you happy, that’s great! 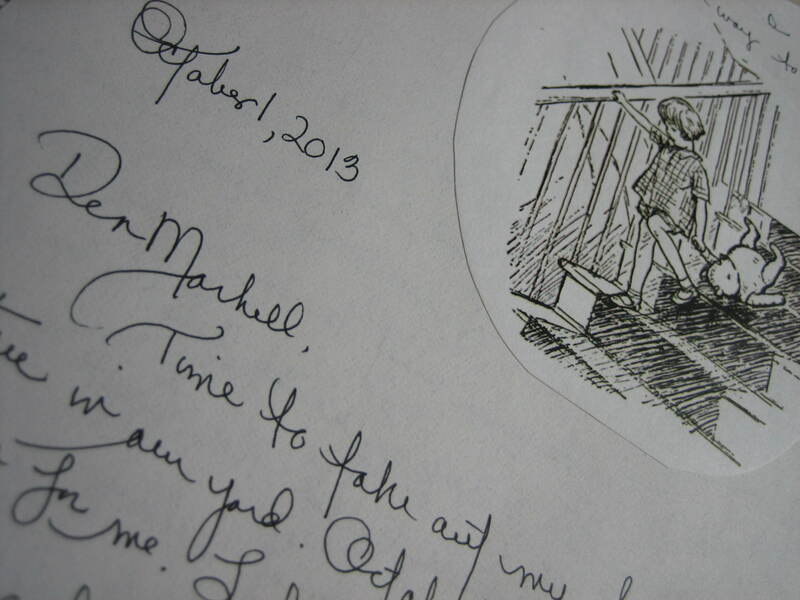 I mean it, but if you’re looking for a creative outlet consider the art play involved in The Art of Letter Writing. Lots of people don’t think they’re very artistic until they give art a try. You might discover an undiscovered pleasure which just could grow into a delightful passion. That’s what happened for me. Jean Renoir said, “True art is in the doing of it.” He didn’t say anything about qualifications, training or end product. Just have fun doing it. Forget the numbers. It’s the one-to-one that matters. Your envelopes are super and so are you! 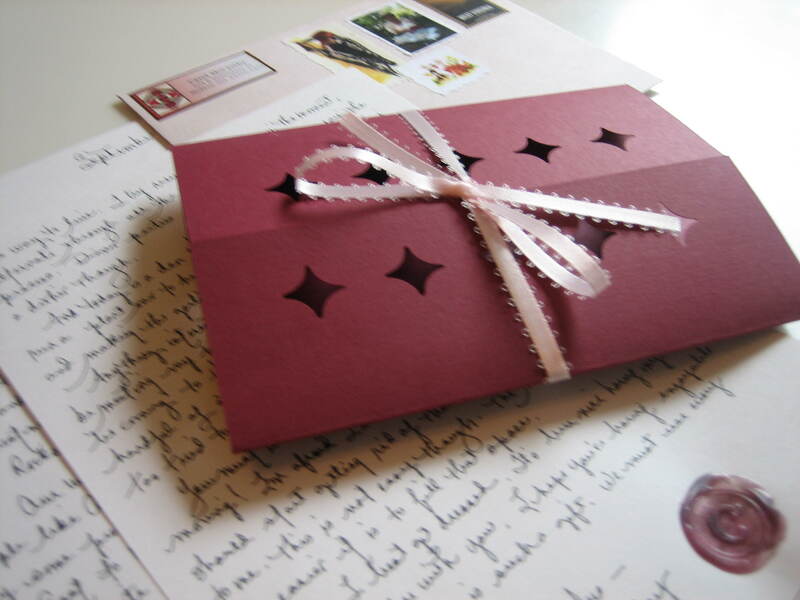 The letter I wrote to you is on its way. I finally got it in the mail. I wish I could just hug you! Such a lovely lady and such a lovely writing style. 😉 I’m writing you another letter while waiting on your reply to my last one. Sending pictures soon! Michelle, Your kind words just made my day! Thank you for visiting with me and for being so very nice. I’m looking forward to your letter.